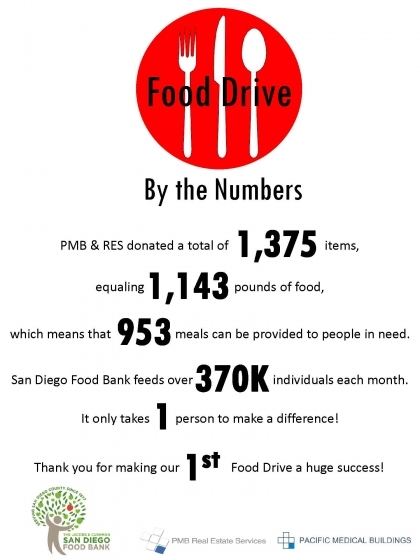 PMB's First Food Drive for the San Diego Food Bank was a Success! PMB Real Estate Services and Pacific Medical Buildings held their first company food drive for the Jacobs & Cushman San Diego Food Bank as a way to celebrate the Season of Giving. The twelve day event raised a total of 1,375 food items. According to the Food Bank, that means that PMB & RES donated 1,143 pounds of food that will provide 953 meals people in need in San Diego. We are extremely proud of our employees for their generous spirit and look forward to hosting another food drive in the near future! The Food Bank feeds 320,000 people per month in partnership with 330 nonprofit community partners including: food pantries, soup kitchens, shelters, low-income daycare centers, senior centers, churches, schools, and day centers for the elderly and disabled. The Food Bank's nonprofit partners collect food from its 72,000 sq. ft. warehouse in Miramar and distribute the food directly to people in need in their local communities. By acting as a central distribution point and through its own direct distributions the Food Bank and its nonprofit partners provide food to communities throughout the county's 4,200 square mile radius. In the fiscal year 2012 - 2013, the Food Bank distributed nearly 20 million pounds of food - the equivalent of 16.6 million meals.